Play along with our roulette and be surprised! Book your apartment in Calpe with the roulette special offer and enjoy your holidays in a Class 1 apartment at the most economical price. From just 30€, you will enjoy all the benefits of a Premier or Select apartment. Call our bookings department now and enquire about our roulette special offer. The perfect excuse to enjoy fantastic holidays in Calpe. Apartments located on the first and second line of the beach await you and your family. 24 hours before you arrive we will notify you of the apartment you have been allocated: Larimar, Topacio, Turquesa Beach, Amatista, Ambar Beach, Esmeralda Suites or Hipocampos; you will enjoy unforgettable holidays at any one of them. *Minimum stay 7 nights. Subject to closure of sales and availability. You will be notified of the allocated apartment building 24 hours before your arrival. Price per apartment and night. You will be informed of the name of the apartment 24 hours before your arrival. Valid stays from 01/05/2019 to 31/05/2019, from 01/06/2019 to 16/06/2019 and from 09/09/2019 to 31/10/2019 . 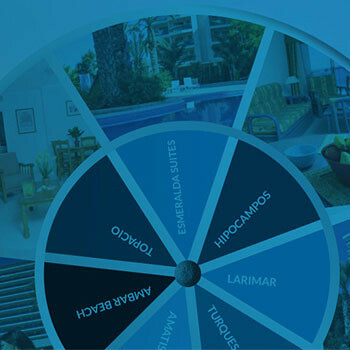 The ROULETTE apartments are located on the first or second line of the beach.